McClain’s is very pleased to announce that Holbein Pure Paste Pigments, our newest water-based ink, are now available. Developed to resemble the palette used for 18th and 19th century Japanese Ukiyo-e prints, this line of paste pigments contain pure color pigments suspended in a base of water, wetting agent and dispersant. These inks are highly concentrated so a little goes a long way. Add water to reach the desired tint or to adjust the transparency. 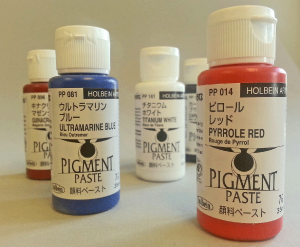 Please note that Holbein Pure Paste Pigments are nonreversible, so be sure to wash all of your brushes right away. 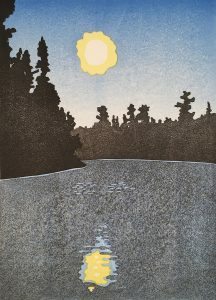 “I just completed my first print using the Holbein Artist Pigment Paste and am very pleased with the results. I used imidazolone yellow, ultramarine blue and sumi ink for my first trial. These Holbein Artist Paste Pigments are just like using water colors except that the colors are more vibrant! The ultramarine blue was transparent, layered nicely with sumi, and creating bokashi (with rice paste) was a cinch. Linocut for Artists and Designers written by long-time linocut artist, teacher and blogger Nick Morley, this instructional book gives you the basics and then goes on to explore many creative ways to do linocut. Excellent full color illustrations and photos show every step of each process described. 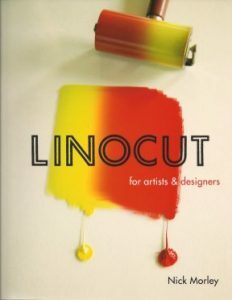 This book is a useful guide for woodcut artists as well as those interested in linocut. Our beloved Namisei Six Tool Set box got a make-over recently featuring the print “Udon” by Alex Prentiss, owner of McClain’s Printmaking Supplies. We are really happy with how it turned out and wanted to show it off. Bring your tools and join Daniel Jasa for an afternoon of sharpening at Atelier Meridian in Portland, Oregon. Learn about maintaining your wood carving tools using natural stones, electric sharpening wheels, and leather honing blocks. 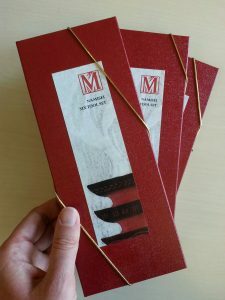 Just in time for the Holiday season, perhaps for that special printmaker in your life (or what the heck, treat yourself! ), we have added several gems to the McClain’s Sale Page. Please note that all sale items are final.